If you are looking for a nutritious, refreshing, simple, and filling snack (or breakfast on the go), nothing beats this Berry Smoothie. It takes only 5 minutes to prepare, and it is packed with multiple high-nutrient foods, which fill you up, and taste great. This recipe makes two 8 oz servings and only 144 calories per serving. 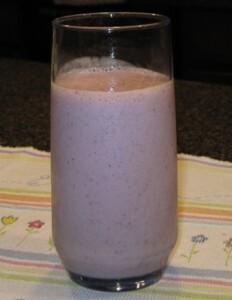 Place all ingredients in a blender, and beat, or frappe, for 5 minutes, and your smoothie is ready to enjoy. For variation I use 2 tsp. of ground flax seeds instead of the whey powder (which I also like to add to my cereal, or oatmeal). I also like to use 5.3 oz of Oikos Organic Fat Free Plain Yogurt in my smoothie, and use other fruit like banana, strawberry, peaches, or whatever fruit I have available on hand. If anything, it makes a quick, nutritious breakfast which I usually start drinking at home and finish it at work before lunch time (I use the full recipe), so it serves as breakfast and mid-morning snack. It really is quite filling.